Suite de Tallulah es propiedad y está diseñado por un diseñador de joyas conocido internacionalmente. Cada detalle en este acogedor, casita romántica fue planeado para que se sienta como mimado y cómodo en el centro de la ciudad. Barrio de lujo, cerca de San Miguel's mejores restaurantes, boutiques y galerías. Caminata plana hacia el jardín, y conveniente a todas partes en el centro, justo al lado del hermoso Parque Juárez. Suite de Tallulah es una pequeña joya en una parte de la ciudad donde la mayoría de vacaciones son mucho más caros. Hermosas ropa de cama, avíos de cocina y muebles de artesanos artesano local. Vista de la azotea exquisito con un ambiente de lounge. Palabras clave: Casita (una pequeña casa). Perfect Weekend Getaway. We're 15-year seasoned travelers to SMA so we know our way around town. Suite Tallula is well located at the corner of Recreo and Huertas. The main plaza (Jardin) is a relatively level walk of 5-minutes. Several good long-time restaurants are nearby including El Correo, El Pegaso and Panio bakery. One of the top new restaurants in SMA, Casa Nostra, is just a half block away. The house is fine, if not high end. The rooftop is up two flights of stairs, one a narrow spiral, so that's quite a climb with a pitcher of margaritas. The kitchen is well stocked and the upstairs bath has a good strong shower. Salma the maid was dependable and efficient. We managed to communicate through google translate (and my poor Spanish). We did not ask her to cook. This casa is a good choice for a couple who plan to spend most of their time in SMA at the Jardin, shopping and dining. The care of the plants upstairs was a bit disappointing. 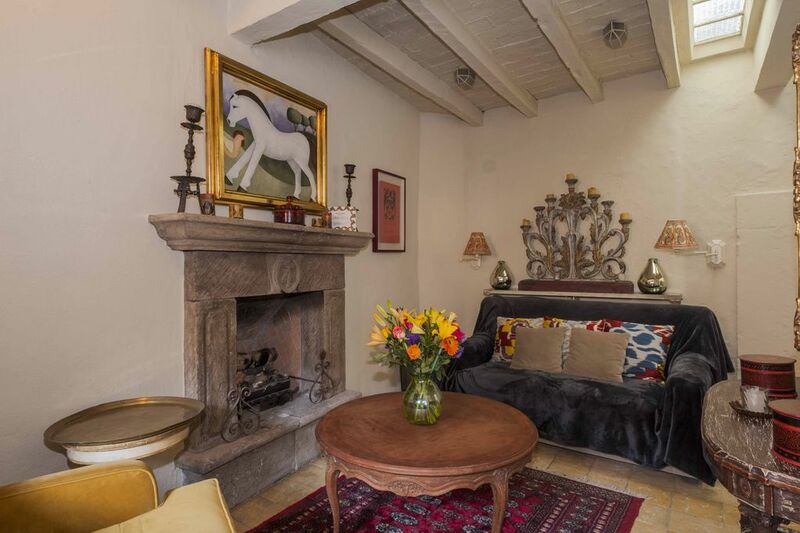 Casita was a short walk to Jardin/Parroquia, Parque Juarez, restaurants, cafes and shopping. Easy to get taxis too when you want to a bit farther afield. Comfortable and clean place to stay with everything you need plus a nice rooftop terrace. Internet worked well. Double-paned windows kept out most of the noise you'd normally expect staying in Centro and street is quiet/residential. I would stay here again. Thank you for the lovely review. Margaret. You & your husband are welcome back any time. A big one bedroom house in Centro ideally situated between the Jardine and Parque that offered everything a couple migh need for an enjoyable stay in SMA. This house is close to Recreo which I consider one of the best streets in SMA. It is a short early morning walk away from the finest bakeries and coffee shops. This a prime location and a comfortable base to explore SMA. The rooftop patio is a great place to have your first coffee and to enjoy a pre-dinner drink and enjoy the sunset. I set up a couple of hummingbird feeders during my stay and had constant entertainment every morning and evening. The patio gets hot during the day and could benefit from an umbrella although there was a covered Anders closed lounge chair. The owner, Cheryl, was helpful with travel info from Mexico City airport and all my tedious enquires. The housekeeper accommodated our schedules and kept the place tidy and well organized. There was some nearby construction and road work going on during our visit but it did not ruin our visit. SMA is an old city, which is part of its charm so some renovation work should be expected from time to time. Don’t let that stress you out too much, just enjoy your stay in this apartment and the city. Cozy, well-appointed, great location for our introduction to SMA. Just right for the two of us - nice layout, good bed, incredible rooftop terrace. Close to everything in the Centro. Housekeeping and laundry services most appreciated. Great stay! Perfect getaway spot in great location! This rental is in a fantastic location: close to the action but away from the noise. Close to numerous great restaurants; good view from the rooftop; everything you need is in the kitchen; rooftop sitting is perfect to relax and get some sun (with the option of being covered); and it has several tienda's nearby. Would definitely stay again! Hosts were easy to contact and someone was there to greet us upon arrival. Escapada de fin de semana perfecto. A un corto paseo plana para Jardin. Restaurantes y bares son un paseo fácil. Rates are subject to change until reservation is confirmed. No Cancellations.